There may be times when you wish to add a percentage of the amount due to a transaction. Sometimes referred to as "surcharges", these percentages can be used for many functions. Often they are used to add a percentage of the amount due to a transaction to help offset the merchant's card processing costs. If you are charging a surcharge for credit card fees, be sure to check your state rules regarding such. This article may be helpful. Percent of Subtotal - calculates the percentage based on the subtotal (before tax). Percent of Total - calculates the percentage based on the total (after tax). Percent of Balance Due - calculates the percentage based on the last amount due. In setting up Card Surcharges you should likely use the Percent of Balance Due function, as you only want to charge the percentage that is being charged to the card. For example, if a customer owes $10 but pays $2 cash, then the percentage Surcharge should be added for the remaining $8 charged to the card. To track your Percentage Surcharges, you should either create or select a Department for tracking purposes. Below is an example. 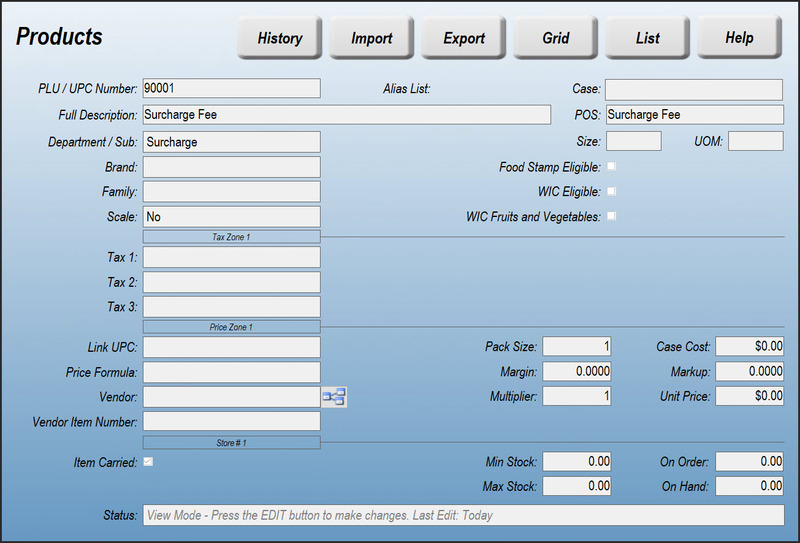 Navigate to the Products screen (Data > Inventory > Products) to create a new Product for your surcharge. There is no need to enter a price or cost. Navigate to the Screen Designer (Setup > Store > Other > Screens). Find and Edit the Brand you created during Step 1. Create a button using the Percent of Amount Due (or any other "Percent of") function. This will add the function "" to the Macro field. You must now edit the field manually. In the example below, we're setting up a 5% surcharge. The percentage amount (5) is the first number on the Macro line, before the  function. If you wanted to charge 10%, you would enter "10" instead. After  is . This denotes a price override of the PLU that you created above. Following the  is the PLU number of the Surcharge Product we created. Finally, the Macro ends in , which is the PLU function. 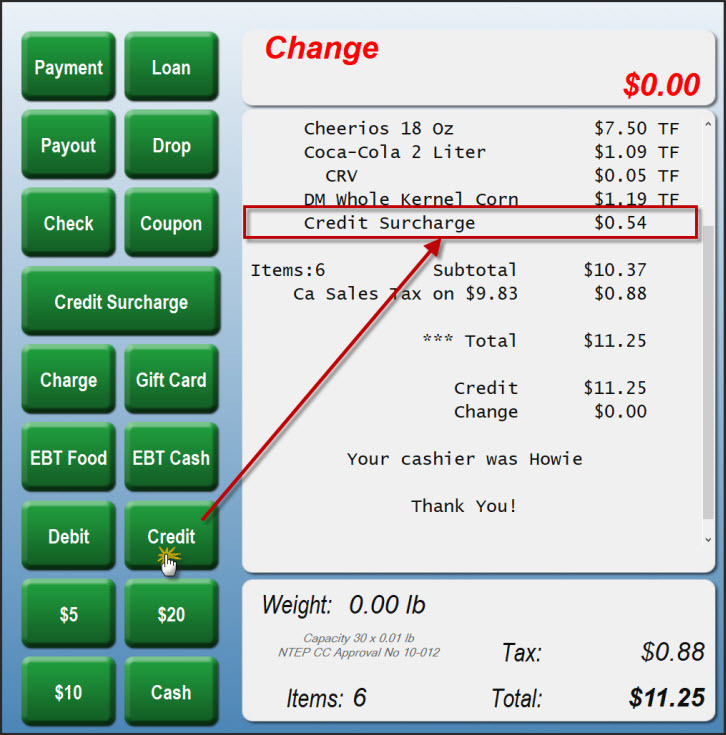 Now that you've completed the setup, SYNC your POS to accept the changes. In the below example we've prepended the Surchage to the Credit button macro. As such, the Credit Surcharge was added to the transaction and the Credit amount was tendered.